Spotify and Waze have announced a partnership today that will integrate key functionality from each other’s services within their respective apps. 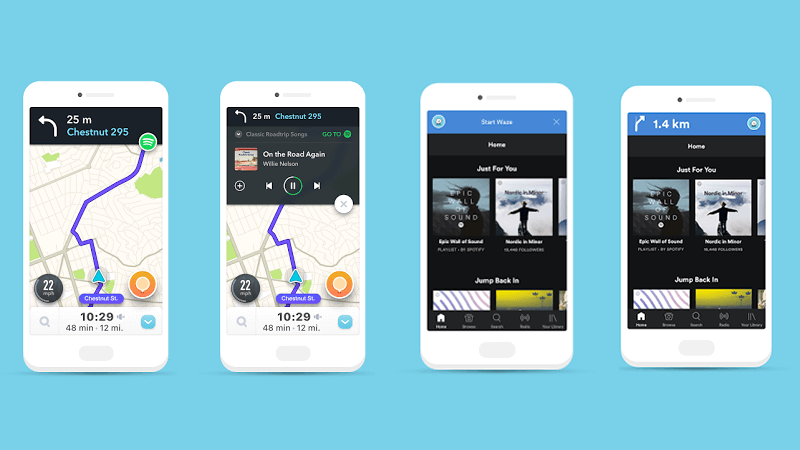 Namely, in a forthcoming update Waze users will be able to listen to and control Spotify playlists from within the crowd-sourced navigation app, and Spotify users will be able to get their Waze navigation instructions while in the music app. Browsing playlists from within Waze will only be allowed when the car is at a standstill, and there’s also a new shortcut to quickly switch between the Waze and Spotify apps. The tie-in makes sense when you consider navigation and music are the two main uses for smartphones in a car. If anything, it’s interesting to see Waze — which was acquired by Google for $1.1 billion in 2013 — partnering with Spotify from music instead of Google Play. Then again Spotify's 50 million-strong subscriber base means it’s much more likely for the integration to actually be used, and could drive some new users to Waze ahead of a wider rollout of its ride-sharing platform. The feature will be rolling out to Android users around the world over the next few weeks — iOS users will have to wait for an unspecified date. Those who prefer Google Maps for directions already have access to a car-friendly interface in Android Auto. Back in November the company launched a version of the software that can run entirely on an Android phone, rather than requiring a new car or aftermarket dashboard display. It lets you access a handful of key apps that have been simplified to be safer for use in the car — with big text and buttons. Some of these apps include Spotify, Pandora, Google Play Music, Google Maps, and Android’s Phone app.